Follow-up meetings is a very powerful feature in MeetingKing. When creating a follow-up meeting, MeetingKing will copy all logistical information such as the list of participants, tags and location information to the new meeting. All you have to do is give the meeting a title and select a date and time. all tasks from previous meeting(s) that were completed between your last meeting and this new meeting. This way nothing will fall through the cracks and things will get done on time, because no-one wants to see his or her name with overdue (red) tasks! How to create a follow-up meeting? 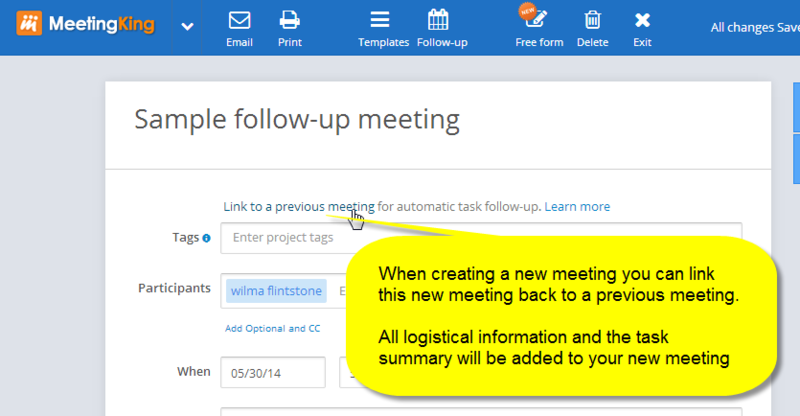 When you start a new meeting you can click a link “Link this meeting to a previous meeting for automatic task follow-up”. A dialog will come up where you can find the meeting you want to link to. 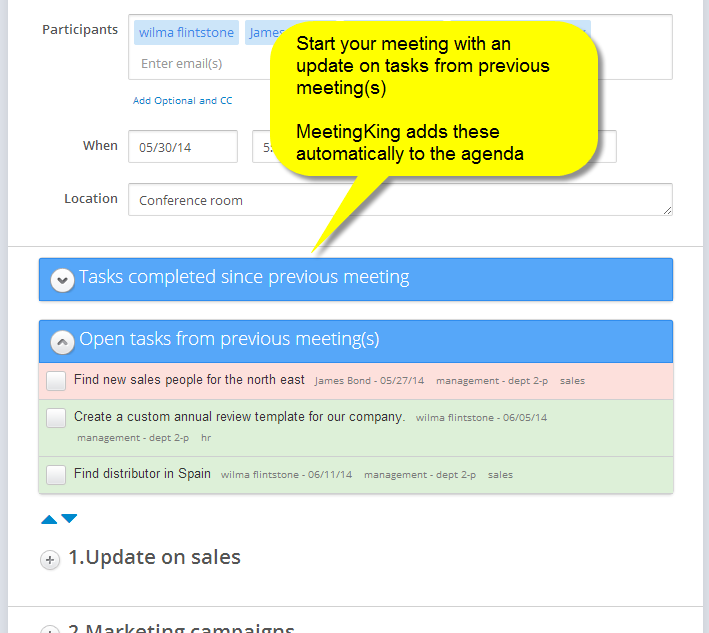 Click that meeting and MeetingKing will add the participants, location, tags and the list of tasks to your new meeting. In an existing meeting you can click the “Schedule follow-up” button on the left of the note taking area. This will create a new meeting with the list of participants, location and tags already completed. You can of course always change this information. The list of tasks from the previous meeting(s) will also be copied. Note: once there is a “follow-up” meeting linked to your meeting, the “Follow-up” button will send you to the follow-up meeting.